There are two branches in Singapore and i personally prefers the Marina Square branch as it is more spacious with a larger seating capacity, so there’s no or little waiting time to get a seat. This branch is only opposite Lady M Confections. 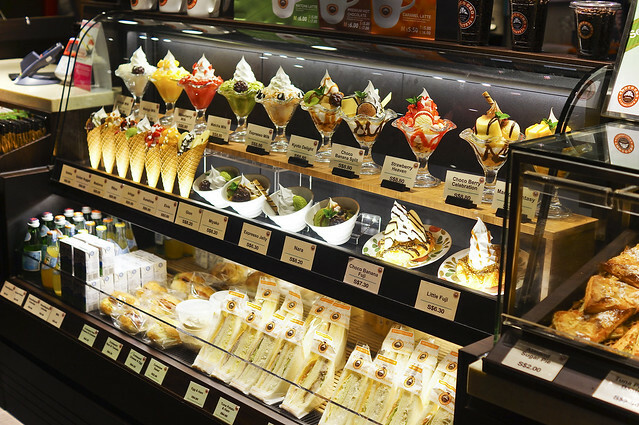 I was attracted by the colorful display of their desserts outside their shop and decided to have a try. St. Marc Cafe mainly serve bread, pasty, sandwiches, soft serve and their most popular Chococro and Little Fuji. Their soft serve dessert mainly range from S$6.30 for the little Fuji to S$8.80 for their Choco Banana Split. I thought St. Marc Cafe is an ideal place to have rest and to re-energise myself with a quick sugar boost. St. Marc Cafe’s items are not exactly the most premium or the most special of all. However, their simple and yet delightful dishes are the reasons why i re-visited this cafe again. It’s the piping hot Chococro chocolate filling that attracted me back, and the crispy biscuit-like crust of the Little Fuji that made me want to visit this place again. I actually think this is one of the star of the show of St. Marc Cafe. Many people are either ordering this Little Fuji, or the Choco Banana Fuji, with added chocolate sauce and banana. So what exactly is the Little Fuji? 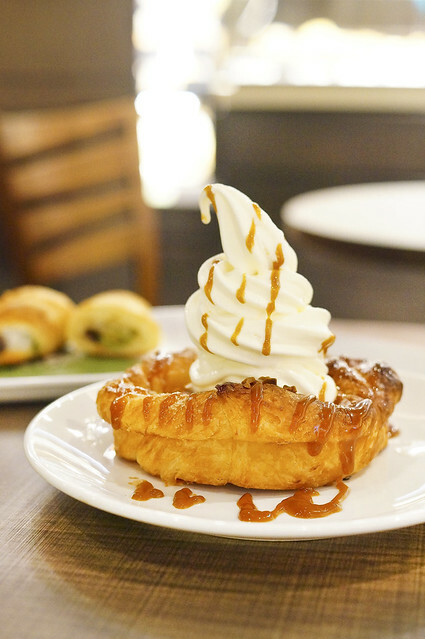 It’s a freshly toasted buttery flavor croissant dough with soft serve with caramel sauce. There is always at 5 to 10 minutes of waiting time for this Little Fuji and to collect at the counter when it’s ready. Therefore Little Fuji is always served piping hot and it’s duper crispy. It’s arguable that the ice-cream taste a little like McDonald’s but what does it matter when the combination of the croissant with soft serve is too good to nitpick. 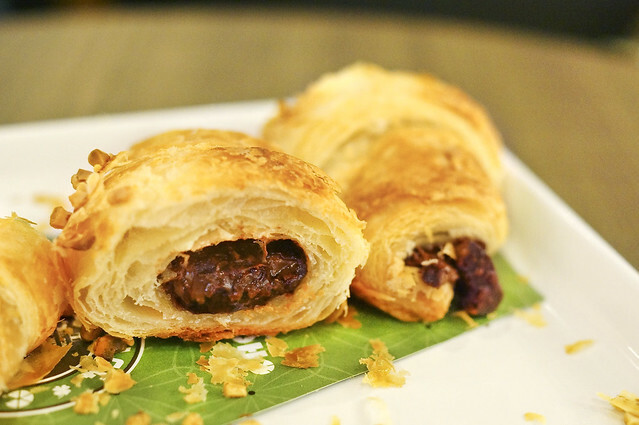 By the name Chococro, it actually stands for Chocolate Croissant. Best part about this? When it’s freshly out from the oven, or at the minimum, it’s warm. 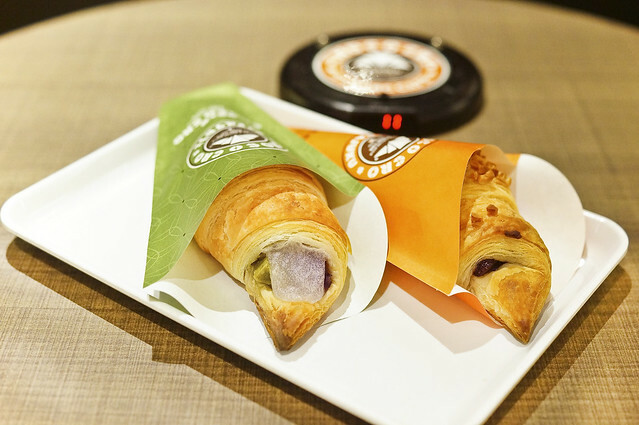 Somehow a pastry can’t go too wrong when there is warm molten hazelnut chocolate and warm crispy croissant involved. This is quite an ideal snack to go with a cup of latte even if you are feeling a little full from a meal. The portion is just right, and the chocolate is not too greasy so it’s almost always a good time to have a Chococro. Daifuku (大福) literally means “Great Luck”. Daifuku is a Japanese confection consisting of a small round mochi stuffed with sweetened red bean paste. 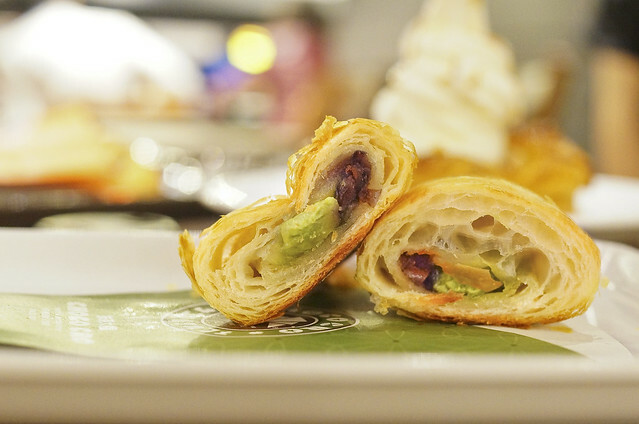 So a Matcha Daifuku Chococro is a actually a confection within a pastry. I initially thought the white filling is green bean paste but i think it’s actually mochi, and was stuff into the croissant together with the red bean paste and matcha cream. This is a rather interesting flavor which is not easily found elsewhere. Catch it before there’s a change in season. 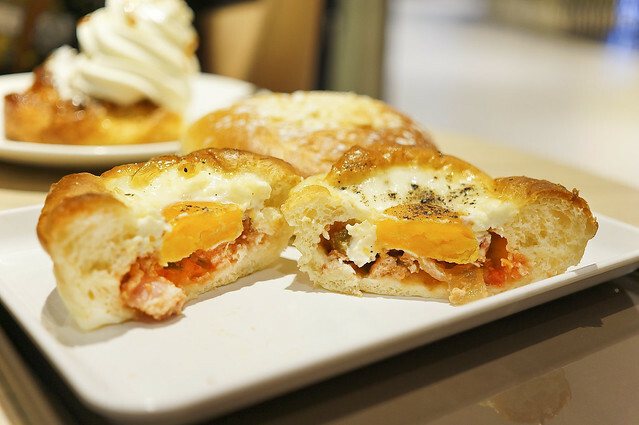 Apart from sweet stuff, St. Marc also offers some savory items like sandwich and bread. There are actually plenty of ingredients in the Salsa Egg Bread – salsa sauce, mayonnaise, bacon slices, pepper and whole egg. It’s almost as good as it looks and only too bad the egg is quite well cooked. It would be best if the egg is only half cooked with the runny egg yolk. The price is also not exactly the cheapest in it’s class. This bread is rather pricey at $2.60, but you will be able to tell the difference between a $2.60 and $1.50. 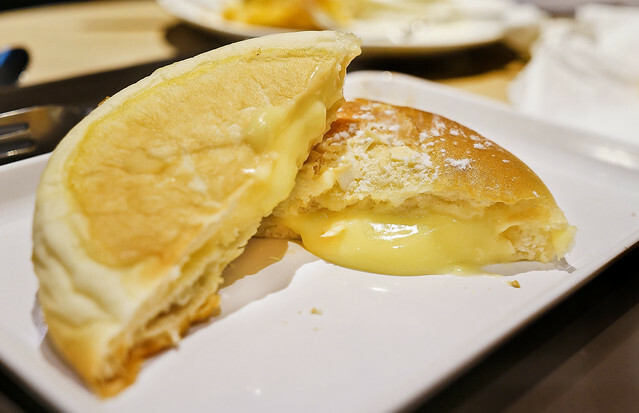 The warm creamy custard flows out from the bread upon cutting it into two. Comparing to ordinary custard, this one has a stronger and aromatic milk taste. The bread’s texture is similar to Barcook’s Raisin Cheese but a little bit softer. This or Chococro at the same price of S$2.60? 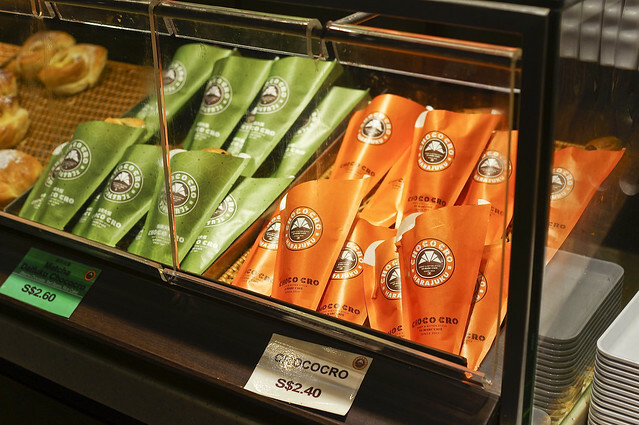 After some consideration, Chococro will be my choice! But this is actually not bad too. I still ordered their Little Fuji or Chococro for my subsequent visits. I personally prefer their croissant dishes rather than their bread. St. Marc Cafe’s ambiance is very similar to Starbucks or Coffeebean kind of ambiance and can reasonably sit for as long as i like. The one thing i like about St. Marc Cafe is their patrons can get free cold water from their water dispenser. This means that i can get to rest in this cafe, and spending only S$2.60 on one Chococro, and to rehydrate myself for free. Once again, i need to emphasis that St. Marc cafe is not offering the most special kind of pastry, or the nicest pastry in Singapore. Their dishes are some very safe recipe that can’t go wrong easily. I personally like them for the reasonable price and the overall comfort offered to their patrons. Sometimes, life’s simple pleasure can be the best kind.